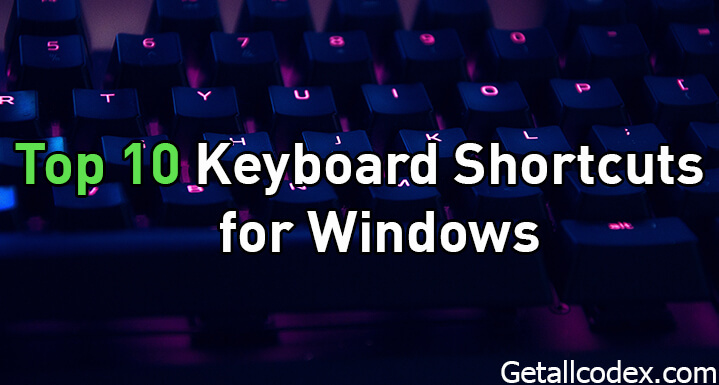 Save time and be more productive with our top 10 keyboard shortcuts for windows. These are the simple tricks to help you save time while you go about your daily life. With the help of the following keyboard shortcut codes, you can easily access the desired destination on your PC in no time. You can quickly minimize to desktop, SNAP windows to the side, lock your PC screen, access your hard drives and much more. Now, we’ve all found ourselves in a situation where we're looking at something on our computer, and it needs to go immediately because maybe someone's coming down the hallway, or maybe your boss is walking toward your cubicle, doesn't matter, it needs to go. Here's a simple shortcut to make that happen, on the quick. All you got to do is put your finger on the Windows key and the D key and press them at the same time. Boom, you're back to the desktop where you can act like you were just doing something else. Sometimes you go on a web browser tab bender, as I like to call it, and you open up 50 tabs with a bunch of different things, but you know something important is in there, however you got too many open, so you start closing them out, closing them out, closing them out, closing them out, then once it's cleaned up you realize you closed the tab you needed. Well, with this little shortcut, all you got to do is press Control + Shift + T right in your browser. This works for every browser that's popular you know, IE, Firefox, and Chrome. So, press Control + Shift + T, and it's going to start opening up all of your previously closed tabs, one by one, till you find exactly what you need. Now, here's a great way to clean up window clutter on your desktop and put two windows side by side for comparison, select one window on your screen, and hold down the Windows key, now press the left arrow or right arrow and it'll still shift over to that side. Do this for the other window and you'll have a side by side comparison. This will also work if you want to maximize the window, just press the up arrow, and if you want to minimize it, press the down arrow. If you've ever written an email in an online platform, like Gmail for example, you might have noticed that when you copy something from another page and then paste it into your email, it retains all of the formattings, that could be the font, the color, even the text size. This can often look really strange when you paste it in there and you're about to send it. Now you want to make it all look uniform so, here’s how you do that. Instead of hitting Control + V to paste, hit Shift + Control + V, it's going to paste unformatted text directly into your email. Taking a screenshot in Windows used to be a big issue. You either had to load Snap Tool, or hit Print Screen, and paste that into Paint, and export it out as an image. No longer, if you want to quickly screenshot the active window you're in, just press Alt + Print Screen, it will automatically make a file for you, and show you a preview of what you just snapped. This can also be done for your entire screen by holding down the Windows key and pressing Print Screen. The images will be saved to your Photos folder by default. How to Quickly Lock your PC screen? Alright, so you're doing some real research or writing, you don't want anyone to see it, but you got to go. You're late for that meeting or your friends are going to lunch, you got to go out the door right now. Well, really quick, just hit the Windows key and press L, that's all you got to do, it'll lock your screen, you can get up, you can move on. Now, up until this point, we've only been talking about keyboard shortcuts, now let's bring the mouse into the mix a little bit. If you need to make a copy of a file, there's no need to do the copy paste thing, just hold down the Control key and drag the file over. It'll instantly make a duplicate when you release the mouse button, pretty nifty. Now, if you do a lot of online trolling, you know the importance of having finely crafted words and proper grammar. Now, sometimes you go back, you look over your post, and you realize, oh, I messed up here, I could have been more insulting, and you really want to deliver that ultimate blow. Now, jamming on that backspace key to fix words can take quite a while, letter by letter by letter, however, if you hold down the Control key you can delete entire words in one fell stroke. It's a big time saver, especially if you just Googled synonyms for your otherwise benign insult and you want to do some more word swapping. Did your dear sweet grandma drop by for the weekend and you want to use the computer machine with her? This is an awesome and easy shortcut to quickly get the screen size magnified. Just hold down the Windows key and press the plus key for an instant zoom. You can go back down by pressing the minus key. This should work for any app running on the desktop. Here's how to quickly access your hard drives anywhere on your system, this goes back to the whole window clutter thing, sometimes you have like 20 windows open, you just need to get to your E drive or your D drive, and it's nowhere in sight. So, at any point when you're using your system, just hold down the Windows key and press E. This is going to open up the My Computer directory and give you quick access to your drives without changing the other stuff that you have going on. So those are our 10 favorite Windows shortcuts, now obviously, these are global, so they’re going to work on Windows 7, 8, 9, 10, 11, 12, what are they on now, 16? Yeah, I believe so. OK, that's what I thought, so, Windows 16, you're good there too. Now please, leave your own in the comments, share with everyone around, and we'll see you next time.